1. Standard porcelain. A standard porcelain crown is fused to base metal, (pfm). The color of the crown is white, with the appearance much like a real tooth. These crowns can be very long-lasting when we prepare your teeth in a proper manner. These crowns are also the main ones we use to go over implants. They cost only $270 per individual crown unit. 2. E.max. The “E.max” are 100% porcelain crowns that don’t contain any metal. We use E.max is for both crowns as well as veneers. This type of porcelain is very chip resistant, and it also has great aesthetics. “E.max” crowns cost $365. Veneers of the same material cost the same as the crowns. 3. Zirconium crowns. This type of crowns is made with using a computer. After the patient’s tooth is prepared, a doctor will create a three-dimensional laser scan of the tooth. The information from the scan is inserted into a cad/cam program inside a computer, which runs a milling machine. The milling machine will later cut the cap (the crown’s inner part). The cap should fit exactly over the surface of the tooth. This will help to make the best bond when the doctor cements on the crown. After this, the doctor will overlay the porcelain on top of the zirconium, in order to give it translucence and depth. This procedure should result in a crown that has a great seal, and also looks quite natural. It should be longer lasting than other crowns. When the doctor links crowns together, it creates a “bridge”. This way, the doctor can replace a missing tooth by placing crowns on the teeth on each side of the gap, with missing tooth gap being filled with a pontic crown attached to those crowns. 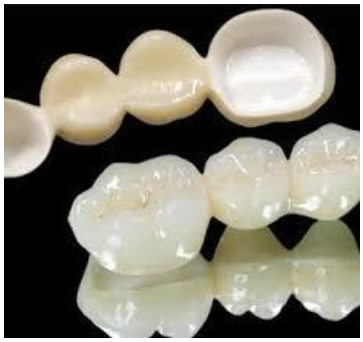 When a bridge replaces on the tooth, it is made of three crowns and called a “three unit bridge”. When on bridge replaces two teeth, it is called the “four unit bridge” etc. the number of units at a price of one single crown will determine the cost of a bridge. Besides the ones we have listed below, we can also provide gold crowns, as well as porcelain crowns fused to gold. However, considering the current price of gold on the market, those crowns would be very expensive, and would not be as competitive with the other crown’s prices we offer. The truth is that the zirconium crowns are a lot better quality to porcelain crowns fused to gold, but they cost more than $100 less than gold crowns. This is the reason patients don’t request gold crowns as much. 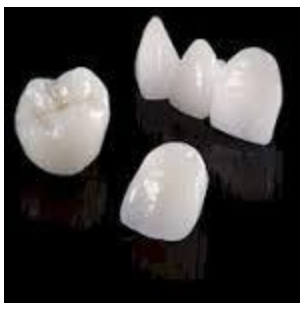 Crown types: At BajaDent Tijuana, we have made available three types of dental crowns. Each type is made out of a different material: PFM porcelain, E.max all porcelain, and Zirconium Ceramic. The description of each crown type is given below. Dental crowns are meant to “cap”, or cover the damaged tooth. 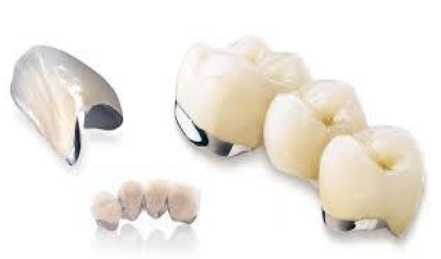 They are prosthetic devices that are fixed and made to improve the tooth’s appearance, alignment, and shape. Often, we place crowns over implants to improve their function and appearance. The color of implants and crowns can be matched to the natural color of the teeth. 1. Restore their tooth to its original shape and size. 2. Supply additional support for a tooth that has already been treated and/or prevent an already vulnerable tooth from being damaged. 3. Restore and cover a tooth that is discolored or unattractive. 4. 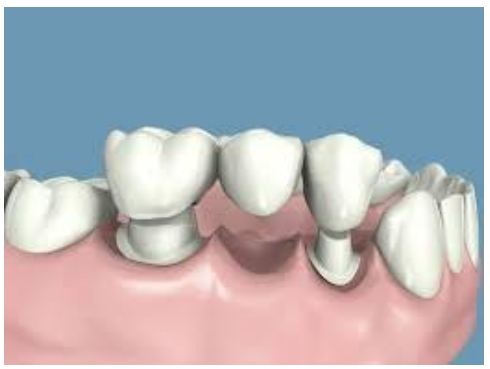 Use a tooth as a sort of abutment to attach a bridge. 5. Protect and cover a tooth after the treatment of root canal.